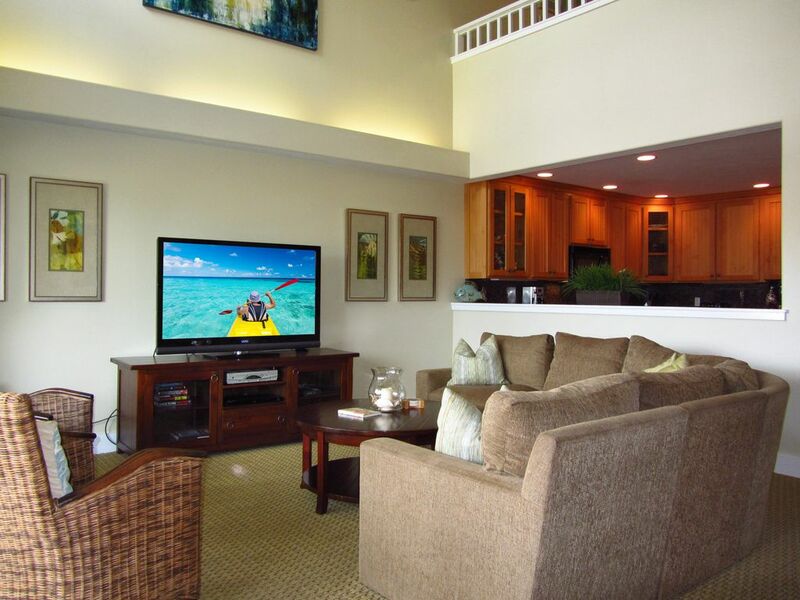 Our beautiful newly furnished luxury 5 bedroom Condo is located at Regency @ Poipu Kai Resort. It is one of only a handful of air-conditioned properties on the Island of Kauai. Our Condo is on the 2nd & 3rd floor with a fantastic view of the mountain range. The resort is located just a short stroll to several world class beaches including Shipwreck Beach, Brenneckes Beach and Poipu Beach which makes them the perfect location for any size group or family. If you have younger children along for the trip you won't find a more perfect children's beach than the little beach formed between Brenneckes and Poipu beaches. Protected from the surf by a natural rock outcropping and featuring a very shallow and gently sloping beach, the children will have a blast! BEST CONDO AT THE REGENCY! A cut above the rest. Finest furnishings including: high quality mattresses, linens, bathrooms stocked with full-sized Malie Organics Shampoo, Conditioner, Body Wash and Lotion, Hairdryers enough kitchenware to cook a Thanksgiving dinner! ALL THREE VILLAS! The Regency at Poipu Kai Resort puts you in the heart of the Poipu Kai beach area and offers easy access to world famous Poipu Beach as well as Brennecke and Shipwreck beach. Just minutes from our luxury condo is fine dining, Kauai's best swimming, surfing and boogie boarding beaches, amazing golf courses as well as great shopping. The resort offers the perfect vacation for every traveler. Amazing stay and great location!! My family and I enjoyed staying here very much. Everything was so clean and up to date, we felt we were living in luxury. Jennifer has great taste in decor and design for her condo. I would definitely recommend anyone to stay here. Walking distance to the beach was a plus as well. Also, she was very patient and was able to answer all my questions. She was very helpful and wanted to make sure we had a comfortable and welcoming stay! We would love to have you and your family back anytime! We had a great time and loved the location! Our extended family of 11 loved our Christmas gathering at this condo. The location was perfect, beautiful beaches were walking distance, and the kitchen and beach supply closet were VERY well-equipped. We'd love to go back! Clean and Exactly as adverised. The condo was exactly as advertised and worked out great for our family of 10. Condo was clean and in great condition. We had a big family trip and needed lots of space. This condo was perfect! Each family got their own room and the common areas could fit us all! Jennifer is a pleasure to work with. We even took advantage of late check out to ease up of having to find something to do all day before we had a late flight in the evening. So close to Poipu beach which if you have kids is the perfect beach! Thank you for the perfect Kauai getaway! Our cancellation policy is full refund if cancelled 90 days prior to arrival!